Tumacacori National Historical Park, Arizona (11) | Flickr - Photo Sharing! Tumacácori National Historical Park is located in the upper Santa Cruz River Valley of southern Arizona. 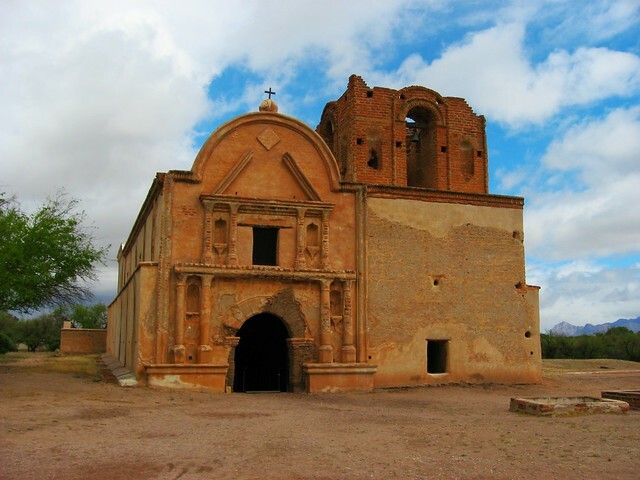 The park protects the ruins of three Spanish mission communities, two of which are National Historic Landmark sites, and it also contains the Tumacacori Museum, a historic landmark building built in 1937 that is also a National Historic Landmark. The park consists of 360 acres (1.5 km2) in three separate units. The Franciscan churches at San José de Tumacácori and Los Santos Ángeles de Guevavi both date to the late 1700s. The earlier Jesuit missions that were established at Tumacacori and Guevavi in 1691 are the two oldest missions in southern Arizona, but there are no visible remains of these early structures. The third unit, San Cayetano de Calabazas, was established in 1756. The Guevavi and Calabazas units are not open to the general public and can only be visited on reserved tours led by park staff. The main unit of the park, the Tumacácori Mission, has a visitor center and museum and is open to the public every day except Christmas and Thanksgiving. A 4.5 miles (7.2 km) segment of the Juan Bautista de Anza National Historic Trail lies along the Santa Cruz River between Tumacácori National Historical Park and Tubac Presidio State Historic Park. San Cayetano del Tumacácori Mission was established in 1691 by Father Eusebio Francisco Kino. It was established one day before the Guevavi Mission, making it the oldest Jesuit mission site in southern Arizona. The mission was originally called San Cayetano del Tumacácori and was located in a different location than the National Monument. It was established at an extant native O'odham or Sobaipuri settlement on the east side of the river. After the Pima rebellion of 1751, the mission was moved to the present site on the west side of the Santa Cruz river and renamed San José de Tumacácori. By 1848, the mission was abandoned and began falling into severe disrepair. Preservation and stabilization efforts began in 1908 when the area was declared a National Monument by President Theodore Roosevelt and continue today. Tumacacori Museum is a museum building built in 1937 within what was then Tumacacori National Monument and is now Tumacacori National Historic Park. Designed by Scofield Delong, it contains interpretative displays relating to three historic missions preserved within the park, and includes artwork created by artist Herbert A. Collins. The museum building, a fine example of Mission Revival architecture, was declared a National Historic Landmark in 1987.